Bowmore, has announced the launch of the latest expression from its limited-edition Vaults Series, of single malt scotch whiskies. ﻿This latest Vaults Series release, is said to be a testament to the craft and patience of Bowmore’s esteemed whisky makers who allowed the liquid to mature for so long. Unlocking the flavours of rich and balanced smoke, that are so distinctive of 1960s Bowmore whiskies. Commenting on the launch, David Turner, Bowmore Distillery Manager, said: “This is the 3rd Bowmore release under my tenancy and is certainly one of the most remarkable whiskies we have produced during my time here. 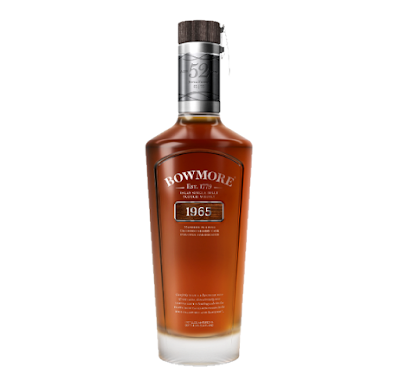 Bowmore® 1965 demonstrates the rewards of our meticulous aging process and showcases the quality of whiskies coming from our talented and dedicated distillery team." Full release details are still to be confirmed, but the first two bottles of Bowmore 1965 will be available from The Whisky Shop and Whisky Exchange, next month for a RRP of £22,300.